This project combines innovative fitness equipment with sensors, connected devices and eHealth methodology to speed-up the recovery of patients with complex shoulder complaints. At the heart of the project is the MuJo™ Fitness System, an advanced piece of equipment invented in the UK that is currently used in the rehabilitation of elite athletes. 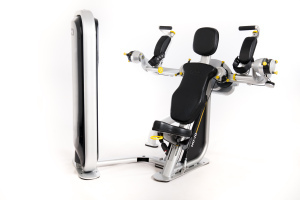 The system uses a unique patented technology that allows full flexibility of movement within a specified range. Adapted for use within the NHS, it is hoped that the system will reduce costs and empower patients to take a more proactive approach to their recovery. Equipped with clinical software that is being developed by the project partners to be fully integrated with the Qinec Ltd electronic patient record system the system will allow physiotherapists the ability to prescribe individual exercise programmes to be carried out on the MuJo™ Fitness System. Patients can then independently log-in to the system where a digital avatar will walk them through their bespoke exercise plan. Advanced movement and load sensors will then record the patient’s performance and feed this back so that both the patient and the healthcare professionals can remotely monitor progress and adherence to the prescribed exercises. It is currently estimated that up to half of patients with musculoskeletal injuries do not comply with their physiotherapist’s recommended training programme. Project partners are MuJo Mechanics Ltd, Qinec Ltd, and the Royal National Orthopaedic Hospital NHS Trust. Harnessing data captured through the clinical software and the movement sensors for secondary use. The portal will facilitate stratification of patient data to allow for evidence-driven comparison of optimal rehab protocols across a variety of patient groups. The portals intended users are clinicians, clinical commissioners, clinical auditors, and public health authorities. Developing a digital solution to capture, store and retrieve specific exercise data generated by the stations. Process and display this data in a user-centric manner relevant to care providers, patients and their families. Use this digital solution to facilitate real time monitoring of patient activity. Add devices to establish a network of connected devices, and share the collected data in real time and across different geographies with care providers, patients and their families in order to i) help monitor and ensure compliance with prescribed protocols, ii) provide support to patients by delivering information and support throughout the rehabilitation process, iii) clarify optimal ongoing treatment options. By making care more structured, quantifiable and outcome driven, enable the collating and retrieval of results, and stratification of patient data to allow for evidence-driven comparison of optimal rehab protocols across a variety of patient groups. Implementation of the system into a patient’s treatment plan is predicted to reduce the number of face-to-face appointments and the overall cost of treatment to the NHS by 20%. The MuJo™ Fitness stations have recently been installed at the Royal National Orthopaedic Hospital NHS Trust, and preparations are underway to conduct a clinical trial to determine if the stations can improve compliance with exercise compared to routine care, and to assess patient and clinician acceptance of these products in clinical practice.